Not much to see at this point, especially from the back of the tapestry. The tapestry includes words saying “SO MUCH MAGNIFICENCE”. The imagery is of a large wave rolling onto the beach. I was inspired by the song, So Much Magnificence, sung by Deval Premal and Miten which provided the imagery for me. I live in Lo de Marcos, Nayarit, Mexico most of the year now. I listen to the waves rolling in as I drift off to sleep at night. I hear them crashing onto the shore during the day. It truly is magnificent, the waves keep rolling in. At this point of the weaving, I have completed the longest word and am hoping when viewed it looks like writing in the sand. I have two more words to complete and then will post a photo of the front of the tapestry. 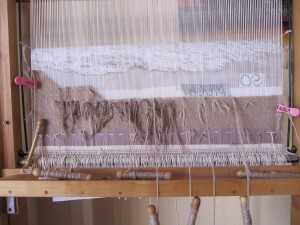 The tapestry is 24″ wide on the upright student loom, 12 epi using cotton seine twine.